The blog at Colette Patterns hinted that they will host another Spring Palette Challenge this year, but I realized that I've already been planning my spring wardrobe sewing. And the earlier I start, the better, so here's what has coalesced from my musings. So, my palette is: dusty rose, brown, white, and celery. Here's the overall plan, and then I'll go into the details. I've planned to sew 6 garments and knit one. There will be 2 skirts, and 5 tops (including the knit one). 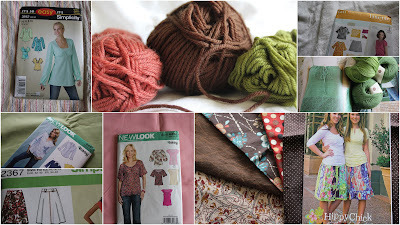 Like with my Fall Palette, I have limited myself (with one exception) to fabrics, patterns, and yarn that I already have. Working from stash! Two of the patterns I've used before, one for a skirt and one for a top. Another Lisette pattern, this time the Market blouse, pattern # 2211. Then next up is the knitting project, a green tank-top with lace detail. I am thinking of doing the lace in the spring green and the rest in the ivy green. The pattern is the Drawstring Chemise by Connie Chang Chinchio, found in Interweave magazine from spring 2008. After that is a stripe skirt in brown tones that I've been wanting to do for a while; the pattern is from Pink Fig, although I don't see it currently listed on the website. The pattern is designed for girls aged 10 to 16 years old, but I think I can add in the extra width as needed! I'm planning on doing the skirt on the left-hand side, without the ruffle. You may recognize some of the fabrics left over from other projects. I finally settled on using New Look 6870 again, this time pairing it with the new pink voile I bought. I will be sewing view B, which is what the model wears. But I think I want to add some lace along the front panel as they do on view C.
And then for the white linen skirt I'll be using Simplicity 2367 again. This is the one project for which I don't have the fabric. So, that's a minus, but I have extra motivation to complete this one because it also figures on my Closing the Gaps list. I'm debating about using a red thread and buttons as accents like they do on the cover illustration. Would that limit its coordinate pieces too much, do you think? Whew, sorry, this is a long post, but we're almost done, only 2 more to go! For the lovely celery cotton from Ray-Stitch I finally settled on this top from New Look 6407: view A, like the model. And, last but not least, I want to use my striped-on-white fabric with the short-sleeve version (view B) of Simplicity 3842. Lovely plans. I likethe knitting - such gorgeous colours in your stripes. I too am planning a Lisette Market blouse. The 3842 looks like it could be a useful top too. I vote for having thread and button accents in the white skirt - little details like that make garments more fun. I like all your plans and your chosen colour palette is really lovely. Like a spring garden! Thanks for the mention! I really like all of your plans and you also have my total admiration for being so organised!Your stripy jumper looks like it is coming along well too and I like the little knitted camisole top too it is so pretty.All of these ideas are nice and pretty and I am looking forward to see your completed spring wardrobe!! Great plans! I like your color palette, and I love the little green knit top! I think red stitching would look great on a white linen skirt, but for greatest matchability you may want to leave it off or make it navy or something instead?